Hello and welcome! 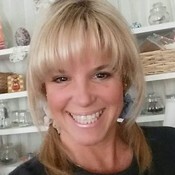 My name is Wendy Witt and I am the Owner/Designer for At Your Witts End Awareness & Inspirational Jewelry & Gifts. Yup!!! My real last name is 'WITT' and I'm usually AT MY WITTS END, my office that is! I grew up loving pretty, delicate and feminine things in my life and just love life in general. It's the little things that matter and what is important to me is creating as much happiness and love in the world as possible. One way of doing so is through my handmade jewelry. HOW I STARTED-- I started making jewelry around 2011 along with my many other hobbies. I love to keep busy and creating beautiful, meaningful items that bring smiles, comfort and love to others brings so much joy into my life. My little Brother was diagnosed with Diabetes in his adulthood and has suffered tremendously ever since. Even through it all he has never given up and keeps on fighting and when he lost his first leg I was crocheting at the time and started to make myself crocheted jewelry with the Diabetes ribbons. Soon after I got requests to make simple beaded bracelets for Diabetes Awareness and then other Awarenesses and one thing led to another and here I am!! WHERE I SELL-- A lot of my Awareness items have been sold all over the world. Most of my items sold are online through ETSY, Facebook, Pinterest, Instagram and I'm now designing my own website and I've been asked to many craft and artist shows and my designs are becoming well known through word of mouth. My goal is to one day have my own little Awareness & Inspiration shop filled with all the creations I make and whether it happens or not, it is a goal and a dream I will keep striving for. A SPECIAL TOUCH-- As I make each piece, I say a little prayer for the receiver and wonder how they are doing, hoping they will be ok and hope that my creation will put a smile on their face and give them hope and peace. Sometimes, the situation is much different where my creation is in remembrance of a loved one. I've even created custom pieces for loved ones at funeral services to bring comfort to those suffering their loss and yes, I've had 2 of my bracelets that went to Heaven which to this day still has me so honored and humbled. PERSONALIZED-- In this day we all unfortunately know someone with some kind of illness and if I can bring some sort of hope, comfort, support, peace and love to them, then I'm on the right path. All of my creations I design can be personalized with stamping. I hand stamp 'each letter by hand', no jig. I have lots of stamping blanks in many different shapes and sizes and I have pet shapes too such as dog bones, paw prints and more!!! My past creations include personalization for Awarenesses, loss of loved one, pets, loss of beloved pet, new babies, new mommies, new relationships, get well, Birthdays, hope and encouragement, holidays, love and much more!!! So if you have an idea, just ask!!! I will work my magic and see what I can come up with for you! My goal is to create something for you that you are happy with or that the receiver is happy with. PACKAGING-- All of my designs will arrive in a nice gift box with a pretty ribbon attached on the outside. If it is for an Awareness, there will be a little 'prayer' note inside the lid and a tiny tag stating what Awareness the item represents. If the item is for a new baby, I can add a "NEW BABY" tag in with the item, loss of pets I can add a "MY BUDDY" tag, for love I can add an "I LOVE YOU" tag and so forth so if you want me to make a special tag, I can do that too. UH OH'S/REFUNDS/RETURNS-- Should you not be satisfied with your item from me, simply email me so we can discuss about partial or full refunds. All of my items are 'hand made' by myself and there can be a possibility for things to happen. Depending on the nature of damage I can replace your item as long as I have all the components but if some are unavailable I will replace them with something just as nice. I will communicate with you to ensure your happiness with my items. QUALITY/PRICING-- Most of my creations are made with beads, pearls, metal, gemstones, wire, stretchy thread and more and I try to choose the best quality without costing you too much but if you prefer sterling or gold or prefer a different quality please let me know in advance so I can accommodate you and price accordingly. with prices being so high everywhere I try to keep my prices affordable and something to look forward to!! As with most jewelry, over time there may be some wear and tear especially if worn every day. There may be some discoloration and stretching. Wearing any of my items in water is not recommended. Any'stretchy' bracelets should be 'rolled' on and not 'pulled and stretched on'. Any 'zipper pulls' are for decoration only and not to be tugged or pulled on while zippering on or off. I highly encourage adult supervision for any baby items that are worn by babies or young children due to the tiny pieces involved. If you come across any issues with any piece that you purchased from me and that are not listed here and feel they should be please send me an email so we can discuss. SHIPPING-- First Class Mail (package) is my most common form of mailing my pieces. I also use Priority Mail when requested. Most of my items are approximately 3oz to 5oz, (individually). You will get a tracking number also for every package shipped except when shipping over seas, then the tracking stops once it's let the US in some countries. Shipping time is usually 3 to 5 business days before it leaves my home but if you need sooner please email me so we can discuss and I will accommodate you the best I can. Once your package has left my home you will receive the tracking number for when to expect your package but again, over seas is up to each country and sometimes tracking is not available. AT_YOUR_WITTS_END_ doesn't have any items in their booth!